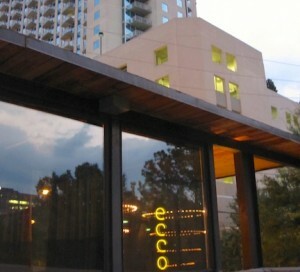 Ecco is growing fresh herbs, peppers, vegetables and more atop their Midtown establishment. Chef Craig Richards hails from Nebraska via Italy. After growing up in the Midwest with a mom cooking vegetables from a can, Richards gained a culinary education from Italian cooking masters to bring his seasoned palette to the South. A veteran of Fifth Group restaurants, after spending a few years at La Tavola as Executive Chef, Craig gained the role after Micah Willix left to try his hand at Latitude. Thanks to Chef Craig, Ecco’s garden is so neat. They’ve engineered a water system to collect moisture from the air-conditioning fans then funnel it into the planters. 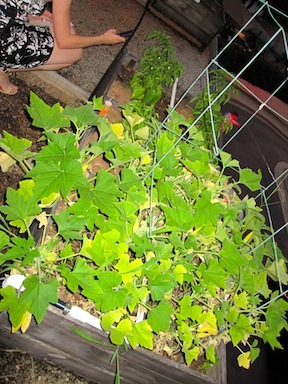 Peppers, basil, beans, tomatoes are all being grown on Ecco’s roof. With the help of its servers, staff and even patrons, Basil is by-far-and-above the most abundant crop. Chef Criag said they’re still having to get a lot of produce from the local farmers but Ecco uses its own homegrown basil and rosemary in all its recipes. Ecco’s summer menu globally inspired cuisine with a strong emphasis on fresh, sustainable ingredients. And where is a better place to get the best produce the city has to offer than from the roof of its very building? Start your summer supper with a Long Live the Queen made with fresh basil, gin, juice, and simple syrup. Keep Calm and Carry On indeed, your highness! This drink is like a Prince William & Kate Middleton romance. Then sample at least two appetizers. Y’all can’t go wrong with the grilled squid in olive puree topped with a sunny side egg and cilantro. It was so neat how the fried egg mingled with the charred flavor of the squid, and the olives were a great compliment. For a second starter, try the stuffed squash blossoms with mozzarella, anchovy and chili flakes in a basil emulsion topped with fried basil. While basil is delicious on its own, its even better when fried to a golden crisp. We had the opportunity to ask Chef Craig how he was able to keep the vegetables so green even after frying and he said he uses an extremely light batter, similar to a tempura, and flash fries the leaves. Oh dear sweet baby Jesus, this is how all basil should taste. As for entrees: opt for the summer fresh catch. On this particular evening, Ecoo offered a wild, Alaskan salmon flown fresh into Atlanta. Then Chef Craig adds two additional seafood flavors via a fresh trout roe swimming in shrimp jus. The salmon was perfectly cooked, and the additional fishy flavors of trout and shrimp were a good touch. With a side of asparagus and a wedge of grilled lemon it was a great, light, healthy meal. Also, taste a couple of glasses of wine (at least one pinot noir and something-else-red-you-can’t pronounce). For dessert – order a glass of Chenin Blanc. It will go great with any dessert on the menu. We like the homemade mint chocolate chip ice cream made with olive oil and sea salt. A little savory and sweet to end the night! Ecco does as much to keep their ingredients in-house as possible. After his time at La Tavola, Chef Craig knows his dough and makes all their pastas fresh daily. Our favorite is the spaghetti al torchio, heirloom tomatoes, torpedo onions, anchovy, basil, pecorino using locally-grown produce (and of course basil from the roof) plus pecorino. A simple dish but so tasty: nothing beats fresh noodles with yummy veggies. For that great crusty bread Ecco uses Holeman & Finch for their baked goods.